I need some help with a recent purchase. Dunhill SK. Seems to be an oddity. I know a picture is worth a thousand words, so I will try to get one posted. Until then, here's my (bad) description: it looks like an egg laying on its side riding on a singe ice-skate blade, with the tip of the blade sticking out in front of the egg about an 1/8th of an inch. It's a very odd shape. Slightly bent stem (maybe 1/8th bent). It is just so odd, that it followed me home because it captured my attention and wouldn't get out of my head. Certainly nothing in the Dunhill catalog that I've ever seen before, but the quality is good and I don't believe it's a knock off. Can't imagine why anybody would try to fake such an obscure item anyway. Anybody have any idea what this thing is, when it was made? Is is rare or just ... odd? Any help or information would be greatly appreciated. Always figured I would try a Dunhill someday, but not in a million years did I envision this one. Still, it is a curiosity. Is there a date code number after the D in ENGLAND? Looks a bit like a tadpole. Seems Dunhill had a couple of wacky ones before the real Dunhills stopped production. That is a seriously cool pipe. Nice find. Congratulations on posting photos; some have never learned and some are too lazy or indifferent. Very interesting piece there! Can you get close ups of the nomenclature? No date code whatsoever. The only stamping on the pipe is what is listed above. 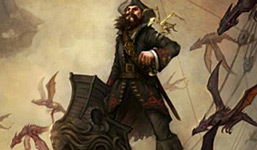 I've spent a fair few days trying to get it narrowed down, but I am out of ideas, so I decided to send up a flare to the Baker Street Irregulars and see what happens. SK must stand for So Kool! . 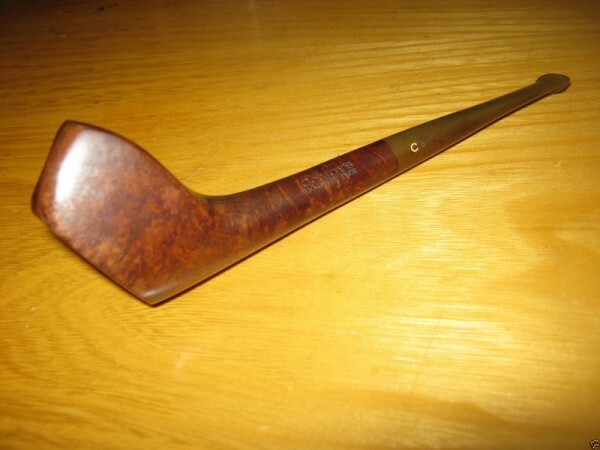 I think the Group Number will place this post-1950, but the Dunhill over London places this pre-1954? That’s off of the top of my head. The shape is way outside my normal style, but it was so unusual that I kept thinking about it for days after I had seen it in an obscure little shop, and finally I just gave in to the inevitable PAD and telephoned the proprietor (no website, no credit cards, sends items with an invoice - what a great old school shop!) and asked them to ship it to me. Now I'm losing sleep because my Google Fu isn't up to the task and I haven't been able to figure out just what I've bought. You know PAD is ruling your actions when you buy something that you have NO idea what it is, what it's worth, or even if you like it. You just know you MUST HAVE IT. Good work. Here it is a tad larger. And good definition of advanced PAD. Thanks jpmcwjr, that looks much better! You can actually read the stamping now. Haven't figured out how to supersize photos yet. Still learning. Congrats on a rare find. Wow! 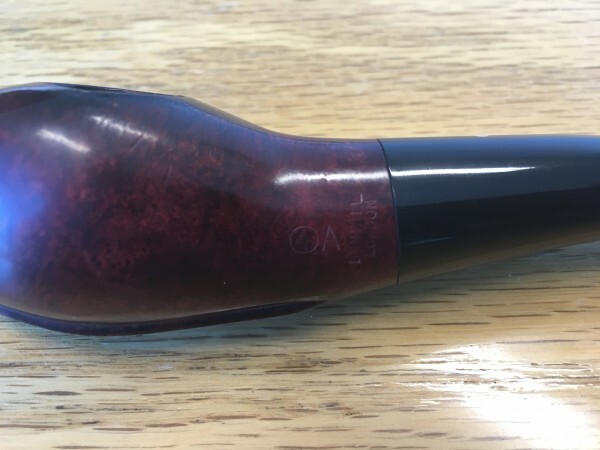 I had a hunch that it might be a bit rare, but I'm no kind of expert at all on Dunhill, or anything else for that matter. Welcome to the forums. That is an odd and cool pipe. Thanks for posting. I've sent georged a PM ( at least I think I did - I'm not seeing a "sent" message in my folder and I'm brand new at this...? ) asking if he would be willing to take a look at it in person and give it a good cleaning and such. I'm just really curious to learn as much as I can about it. Wouldn't be a catastrophe if it were to turn out to be a fake, but it would be even more interesting to learn the date and backstory to this shape if it is a custom made thing from somebody's own design or sketch. How cool would that be?! 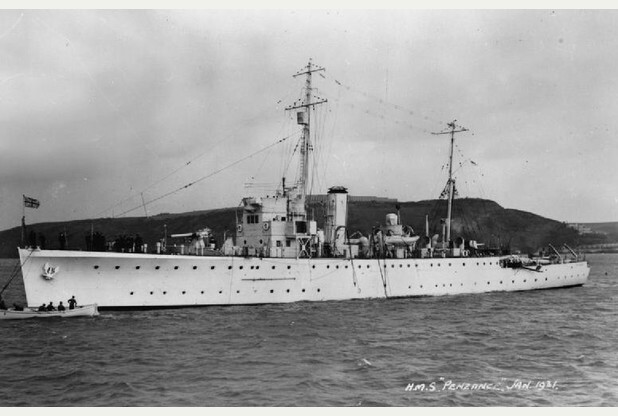 An example, of a thumbnail named "hms-penzance-1940...." followed by "-150x100.jpg" is the name of the photo in my album, and it's the "-150x100" that limits the size. 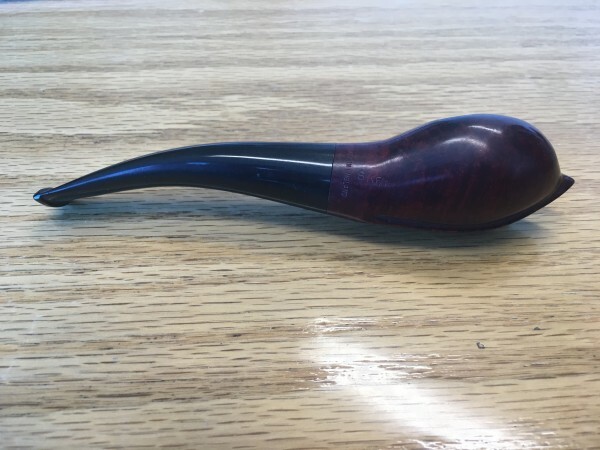 Nifty exercise in pipe i.d. and authentication. 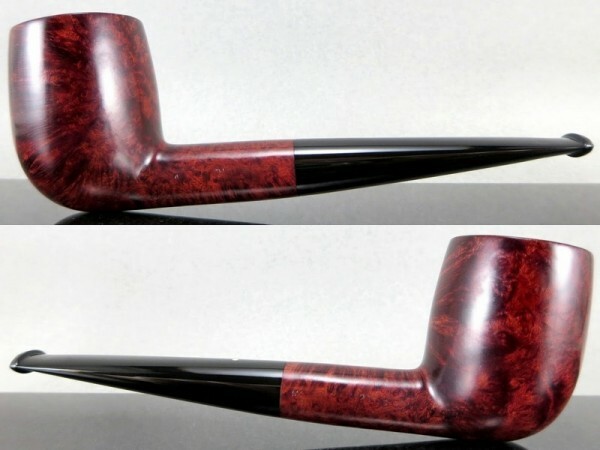 Dunhill has made such a thing of traditional classic shapes, that this one gives pause, but I somewhat feel this is a true departure, a glimpse into the rebellious souls on the Dunhill line. The guys who didn't like wearing tuxedos to work. Thanks for that jpmcwjr, that's pretty straight forward and will definitely come in handy! Much appreciated. Mso489, this has been a fun exercise indeed. I walked away from this pipe because it was interesting, but not really in my wheelhouse. After leaving the shop I just kept thinking about it and how odd it was, and what if? 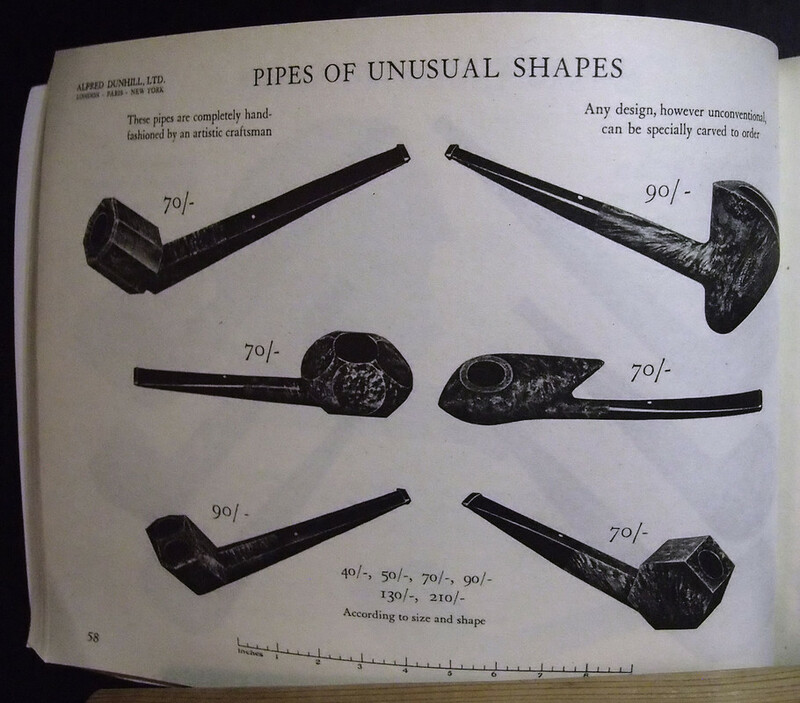 What if it really is something unusual, and not just because I'm not very knowledgeable about Dunhill pipes. Figured, what the heck, it would keep me off the streets if I bought it and then tried to figure it out. Called the shop and had them post it to me. I knew exactly the place to come for answers too. I contacted my go to Dunhill guy, haven't heard anything back yet. If anyone knows anything about it, he will. 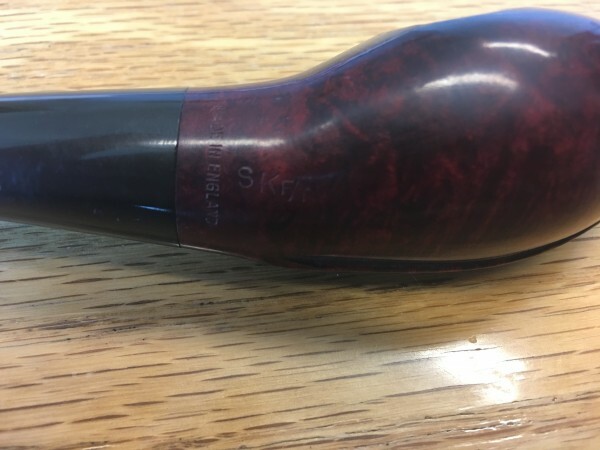 "Quite a rare Dunhill shape that I've only come across a couple of times..."
Wow, those are stunning! My father would have loved one of those, had he ever been able to see one. He was mad about golfing. 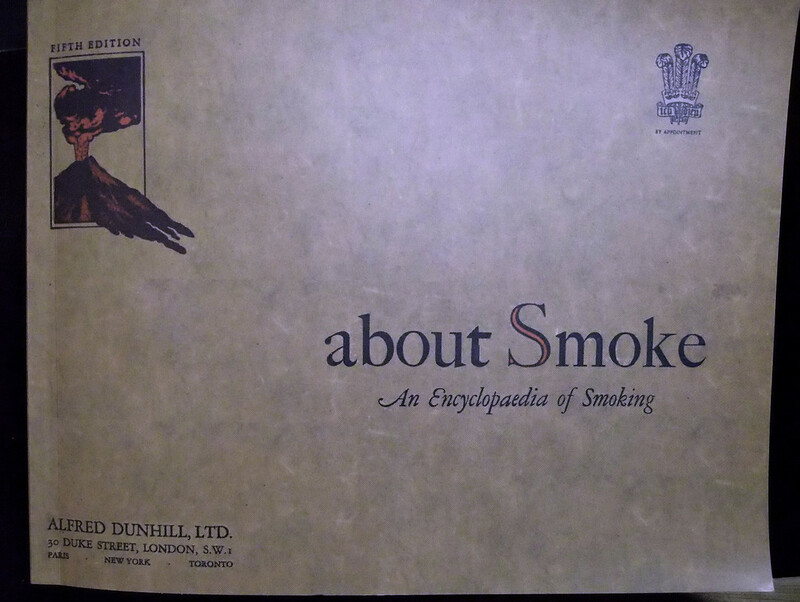 I would never have guessed that Dunhill and Comoy did such things, even back in the day. That's pretty spectacular and really something to behold. 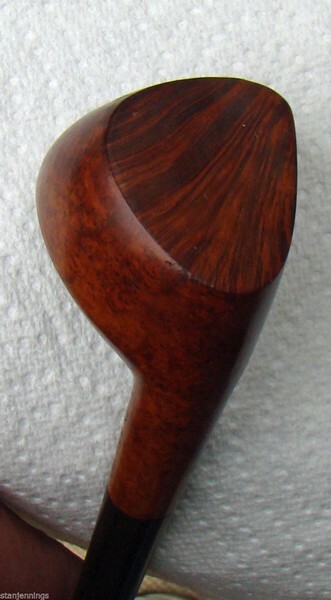 I would love to someday actually see one of those Dunhill Cubist looking pipes in person. I bet they are something to behold too! I had always considered Dunhill to be one of the standards for British style, and it's really cool to see that they had such a streak of nonconformity. Bet those pipes got some attention and started a few conversations down at the gentlemen's clubs of the time. FWIW I could swear I've seen this shape at least once before online. My Vote is that it's real. One of the big ebay sellers had one for sale a few years ago...... I had it in my watch list, and if I recall it was a root briar and he called it a "dolphin" shape....... I think its the only other one I've seen. Very cool shape! and congrats on the purchase! The only picture left at ebay. That's certainly the one, no doubt about it. Makes sense that it is from the 50s with that aerodynamic theme going on too. It's odd that one has "SSK" on the left side, and mine has "SK" on the opposite side. Love a good mystery! Especially the kind that you find out the ending to. I knew you guys could solve this one!! Bravo, Dmcmtk! 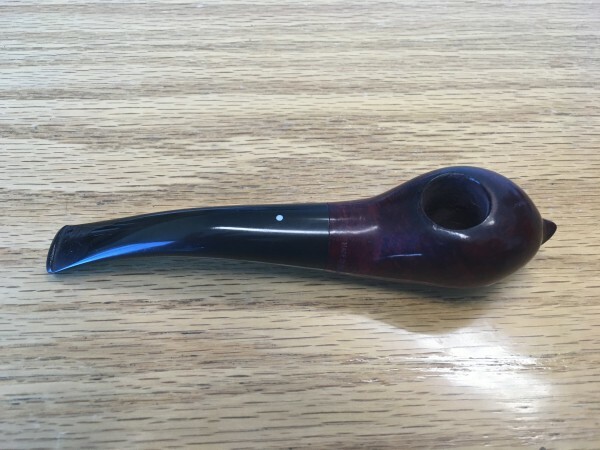 I saw one go a few years ago on eBay listed as “vintage wood pipe.” I had the high bid at five dollars all week and in the last five seconds, it shot way up, and I lost. 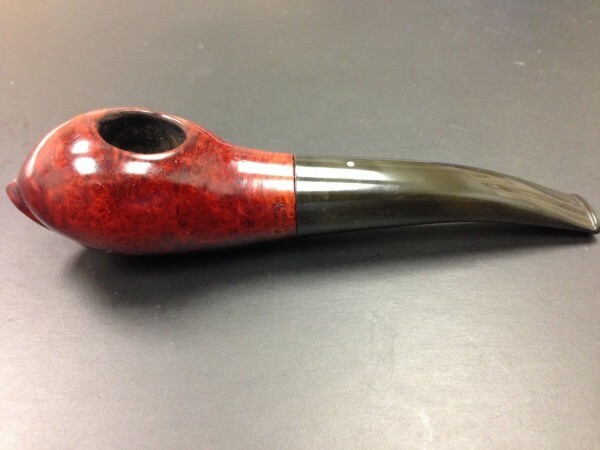 Not my style of pipe at all, but I love gimmicks and oddities and this certainly fits those categories! Okay, after seeing those photos my one raised eyebrow has now gone down. Any suggestions for someone to clean this pipe up for me? I don't want to faff about with it as I have no experience with restoring estate pipes and really don't want to mess it up. It needs to be cleaned and sanitized and there are some tooth marks and scratches on the stem and minor dings and scratches around the bowl. I'm thinking it should clean up nicely, but it's beyond my abilities at this point. Yes, I can unreservedly, and highly recommend you contact Anthony Cook. This is a 1923 Bruyere he did for me. I just realized I set aside your PM several days ago verporchting, then spaced getting back to you. My apologies. Georged, no worries, I wasn't even sure if my attempted PM went through. I was just happy that I was able to post photos and get such great replies and advice from you guys. Big thank you to everyone. This forum community is a real gem.